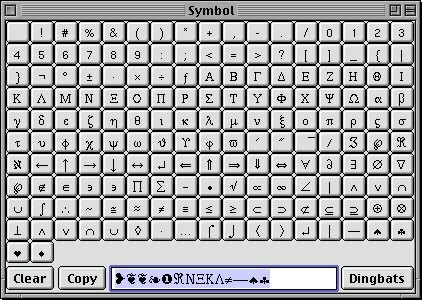 Symbol is a very simple app which displays all of the symbol characters, lets you select those you want, and then copy them to the pasteboard for use in other Mac OS X apps. As a bonus, it also displays the Zaph Dingbats™ characters, and it's free! You can download the source or the app already compiled for Mac OS X. If that doesn't work, try PEAK's submissions.